Jean shopping is never an easy experience, at least for me it has never been. First I'm short, meaning I either have to hem everything (and then the knee proportions are off) or track down jeans that have a 30" inseam. I feel like I have tried so many kinds at this point I just give up, as most of the ones I've bought over the years I ended up selling because I was never satisfied with the fit. I like the mid-rise of the Cheap Monday jeans, but the fabric isn't that great quality and rips easily. I like the fit of Madewell jeans but the fabric stretches like crazy after one wear. I had the perfect pair of Gap jeans for a few years but I wore them to shreds and I don't think they've made a similar style since then. Right now I really only have one pair of pants I wear - a pair of J Crew black matchsticks (the fabric isn't even denim so I don't know what to call it) but the fit is just right and they don't stretch after one wear. So maybe I'm all set then and don't need more pants - maybe one perfect pair is enough. (Except I should wash them, probably.) Still, I'd like to track down at least one or two more pairs of pants I can depend upon. I've never tried the Acne Hex but I was thinking about it - but then that brings in the hemming issue, which I can "solve" by tucking the extra 3" up and under - still for that much money I shouldn't have to do that. Luckily it seems that ankle length pants seem to be an in thing, so that means perfect length pants for us short people - so maybe I'll have some luck. I'm kind of thinking of these Current Elliot paprika pants - but I've heard their sizing runs large so I'd have no idea what size to order. 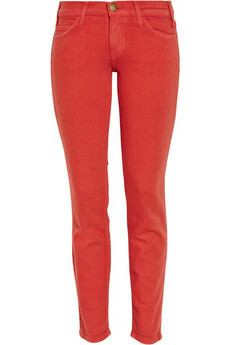 I don't know what's up with my coral-red pants obsession right now. In general I've tried to teach myself that pants shopping is just one of those things that must be done in person, but it's so tempting and easy to just do it all online. Have you guys found anything similar in fit to the J Crew matchstick that you like? The ideal pair, for me, would be : dark wash denim, slim but not super super skinny fit, ankle length, no distressing, sturdy fabric, not stretch after one wear, plain back pockets, and comfy. I'm kind of thinking they don't exist but I could be wrong.